Small hand held air powered cloth cutting machine with round knife blade and carbide tipped bottom blade for scissor like precision cutting. 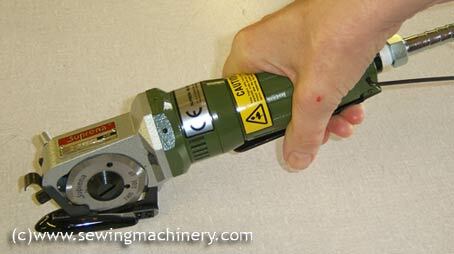 Easy-to-operate & powerful hand cutter for effortless precision cutting of fabrics etc. Powerful 0.4hp (300W) air powered motor. Metal cutting head and motor housing for full industrial use. Easy grip motor body for better cutting manoeuvrability. Hand lever for easy operation of air motor. Suprena model PC1062 UK CE with manufacturers warranty. Full stock of spares & blades available from our parts dept.